We are experts when it comes to recycling. 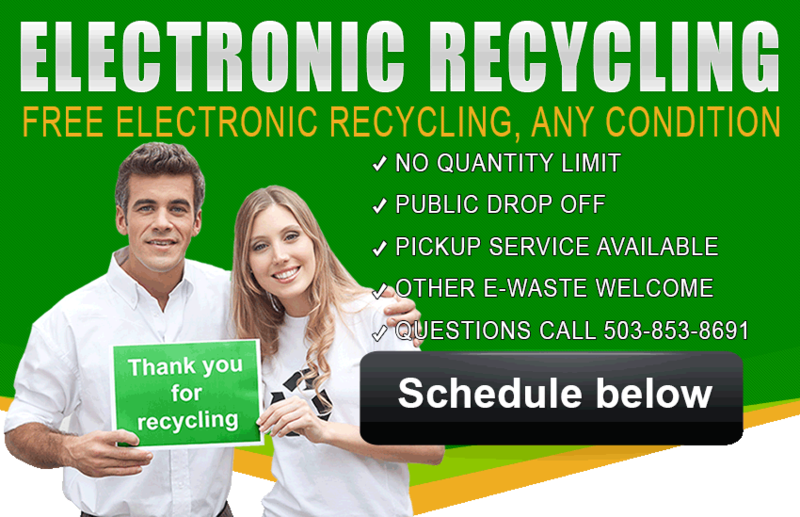 The Best Free Electronics Collection and Electronics Recycling in Portland Oregon. Take a look around your office or home. How much space is being wasted with old, outdated electronics that you no longer use? Not only do those old computers, printers, monitors, phone systems, TVs, and other appliances take up a lot of space, but they’re just sitting there gathering dust and wasting away. They could be safely and ethically recycled or reused. JunkComputer is the only electronic waste collection company who offers convenient electronic recycling. Portland businesses and residents have come to expect the higher standard of electronic recycling that JunkCompter offers. We provide convenient door-to-door pickup services. That’s right, we’ll come to you to pick up any electronics and help with computer recycling. Portland – you no longer have an excuse! Commercial Electronics – i.e. computers, monitors, phone systems, etc. Restidential Electronics – i.e. TVs, VCRs, DVD players, etc. Simply put, if it is powered by batteries or plugged into a wall, and you no longer need it – do the responsible thing and contact the most ethical electronics recycling Portland has to offer — JunkComputer. Click here to get a FREE schedule a recycling pickup today or call us at 503 853 8691. Did you know that electronics contain large amounts of hazardous materials? If these are not recycled in a responsible, ethical way, they can pose a great risk to us as well as our environment. We do more than say we’re green and talk about safe recycling. We are committed to adhering to the standards set by the Basel Action Network (BAN) and e-Stewards Recycling Certification regarding “E-waste” export for reuse, repair and refurbishment. We’re the first companies, to offer e-waste collector at the office. We support the Responsible Electronics Recycling Act (H.R. 2284). The Responsible Electronics Recycling Act is a proposed legislation which would restrict toxic e-waste exports to developing countries who lack adequate safeguards for the environment and workers. Responsibly recycle electronics. Portland has come to trust the JunkComputer because they know e-waste is being reused or recycled without damaging our planet. Data destruction—Your old computers and electronics may still contain sensitive data that you don’t want anyone else to have access to. That’s why JunkComputer also offers data destruction services. We guarantee that all data destruction services are performed to NIST 800-88 standards. We offer on-site or off-site data destruction services. Electronics Recycling: Think of JunkComputer as your complete e-waste partner. In addition to picking up and recycling your electronics, we also provide education about the e-waste industry, local and federal legislation and the general issues of e-waste. We can assist with the budgeting process so that your business can include e-waste recycling as a line item. This will eliminate any surprise costs when it comes time to recycle your e-waste as we are providing the quote and working with you during the budgeting process, so there are no surprises. We are a full-service electronics recycler and collector specializing in all types of electronics waste (e-waste). We offer same day pickup service in the Portland-Vancouver Metropolitan area. Pickups are often free of charge and can be done at your convenience. We currently collect a few thousands of pounds of electronics per month, and we have the capacity to process large corporate e-waste pickups with a very short notice, in most cases we can offer same day recycling pickup service if you schedule early in the day. If you need a quick response, please use the form above or call us directly at 503 853 8691 to discuss your recycling needs. Copyright © 2019 Junk Computer. All Rights Reserved.